Not to be confused with Hurricane Catarina. For other storms of the same name, see Tropical Storm Katrina. The storm originated over the Bahamas on August 23, 2005, from the merger of a tropical wave and the remnants of Tropical Depression Ten. Early on the following day, the tropical depression then intensified into a tropical storm as it headed generally westward toward Florida, strengthening into a hurricane only two hours before making landfall at Hallandale Beach and Aventura on August 25. After very briefly weakening again to a tropical storm, Katrina emerged into the Gulf of Mexico on August 26 and began to rapidly intensify. The storm strengthened into a Category 5 hurricane over the warm waters of the Gulf of Mexico but weakened before making its second landfall as a Category 3 hurricane on August 29, over southeast Louisiana and Mississippi. As Katrina made landfall, its front right quadrant, which held the strongest winds, slammed into Gulfport, Mississippi, devastating it. Overall, at least 1,836 people died in the hurricane and subsequent floods, making Katrina the deadliest United States hurricane since the 1928 Okeechobee hurricane. Severe property damage occurred in numerous coastal areas, such as Mississippi beachfront towns where boats and casino barges rammed buildings, pushing cars and houses inland; water reached 6–12 miles (10–19 km) from the beach. The total property damage was estimated at $125 billion (2005 USD), roughly four times the damage wrought by Hurricane Andrew in 1992, tying Katrina with Hurricane Harvey of 2017 as the costliest Atlantic tropical cyclone on record. 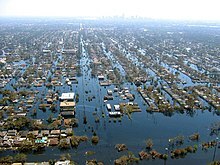 Over fifty breaches in surge protection levees surrounding the city of New Orleans, Louisiana was the cause of the majority of the death and destruction during Katrina. Eventually, 80% of the city, as well as large tracts of neighboring parishes, became flooded, and the floodwaters lingered for weeks. Most of the transportation and communication networks servicing New Orleans were damaged or disabled by the flooding, and tens of thousands of people who had not evacuated the city prior to landfall became stranded with little access to food, shelter or basic necessities. The scale of the disaster in New Orleans provoked massive national and international response efforts; federal, local and private rescue operations evacuated displaced persons out of the city over the following weeks. Multiple investigations in the aftermath of the storm concluded that the U.S. Army Corps of Engineers, which had designed and built the region's levees decades earlier, was responsible for the failure of the flood-control systems, though federal courts later ruled that the Corps could not be held financially liable because of sovereign immunity in the Flood Control Act of 1928. There were also widespread criticisms and investigations of the emergency responses from federal, state and local governments, which resulted in the resignations of Federal Emergency Management Agency (FEMA) director Michael D. Brown and New Orleans Police Department (NOPD) Superintendent Eddie Compass. Many other government officials were criticized for their responses, especially New Orleans Mayor Ray Nagin, Louisiana Governor Kathleen Blanco, and President George W. Bush. Several agencies including the United States Coast Guard (USCG), National Hurricane Center (NHC) and National Weather Service (NWS) were commended for their actions. The NHC was found to have provided accurate hurricane forecasts with sufficient lead time. Hurricane Katrina formed as Tropical Depression Twelve over the southeastern Bahamas on August 23, 2005, as the result of an interaction between a tropical wave and the remnants of Tropical Depression Ten. The storm strengthened into Tropical Storm Katrina on the morning of August 24. The tropical storm moved towards Florida and became a hurricane only two hours before making landfall between Hallandale Beach and Aventura on the morning of August 25. The storm weakened over land, but it regained hurricane status about one hour after entering the Gulf of Mexico, and it continued strengthening over open waters. On August 27, the storm reached Category 3 intensity on the Saffir-Simpson hurricane wind scale, becoming the third major hurricane of the season. An eyewall replacement cycle disrupted the intensification but caused the storm to nearly double in size. 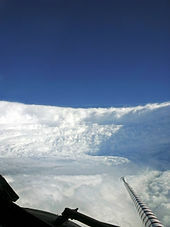 The storm rapidly intensified after entering the Gulf, growing from a Category 3 hurricane to a Category 5 hurricane in just nine hours. This rapid growth was due to the storm's movement over the "unusually warm" waters of the Loop Current. Katrina attained Category 5 status on the morning of August 28 and reached its peak strength at 1800 UTC that day, with maximum sustained winds of 175 mph (280 km/h) and a minimum central pressure of 902 mbar (26.6 inHg). The pressure measurement made Katrina the fifth most intense Atlantic hurricane on record at the time, only to be surpassed by Hurricanes Rita and Wilma later in the season; it was also the strongest hurricane ever recorded in the Gulf of Mexico at the time. However, this record was later broken by Hurricane Rita. 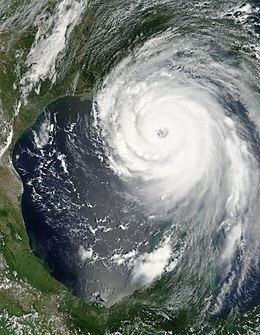 The hurricane subsequently weakened due to another eyewall replacement cycle, and Katrina made its second landfall at 1110 UTC on August 29, as a Category 3 hurricane with sustained winds of 125 mph (205 km/h), near Buras-Triumph, Louisiana. At landfall, hurricane-force winds extended outward 120 miles (190 km) from the center and the storm's central pressure was 920 mbar (27 inHg). After moving over southeastern Louisiana and Breton Sound, it made its third landfall near the Louisiana–Mississippi border with 120 mph (190 km/h) sustained winds, still at Category 3 intensity. Katrina maintained strength well into Mississippi, finally losing hurricane strength more than 150 miles (240 km) inland near Meridian, Mississippi. It was downgraded to a tropical depression near Clarksville, Tennessee, but its remnants were last distinguishable in the eastern Great Lakes region on August 31, when it was absorbed by a frontal boundary. The resulting extratropical storm moved rapidly to the northeast and affected eastern Canada. The United States Coast Guard began pre-positioning resources in a ring around the expected impact zone and activated more than 400 reservists. On August 27, it moved its personnel out of the New Orleans region prior to the mandatory evacuation. Aircrews from the Aviation Training Center, in Mobile, staged rescue aircraft from Texas to Florida. All aircraft were returning towards the Gulf of Mexico by the afternoon of August 29. Aircrews, many of whom lost their homes during the hurricane, began a round-the-clock rescue effort in New Orleans, and along the Mississippi and Alabama coastlines. President of the United States George W. Bush declared a state of emergency in selected regions of Louisiana, Alabama, and Mississippi on August 27. "On Sunday, August 28, President Bush spoke with Governor Blanco to encourage her to order a mandatory evacuation of New Orleans." However, during the testimony by former Federal Emergency Management Agency (FEMA) chief Michael Brown before a U.S. House subcommittee on September 26, Representative Stephen Buyer (R-IN) inquired as to why President Bush's declaration of state of emergency of August 27 had not included the coastal parishes of Orleans, Jefferson, and Plaquemines. The declaration actually did not include any of Louisiana's coastal parishes, whereas the coastal counties were included in the declarations for Mississippi and Alabama. Brown testified that this was because Louisiana Governor Blanco had not included those parishes in her initial request for aid, a decision that he found "shocking." After the hearing, Blanco released a copy of her letter, which showed she had requested assistance for "all the southeastern parishes including the City of New Orleans" as well specifically naming 14 parishes, including Jefferson, Orleans, St. Bernard, and Plaquemines. In Florida, Governor Jeb Bush declared a state of emergency on August 24 in advance of Hurricane Katrina's landfall. By the following day, Florida's Emergency Operations Center was activated in Tallahassee to monitor the progress of the hurricane. Before Katrina moved ashore, schools and businesses were closed in the Miami area. Cruise ships altered their paths due to seaports in southeastern Florida closing. Officials in Miami-Dade County advised residents in mobile homes or with special needs to evacuate. To the north in Broward County, residents east of the Intracoastal Waterway or in mobile homes were advised to leave their homes. Evacuation orders were issued for offshore islands in Palm Beach County, and for residents in mobile homes south of Lantana Road. Additionally, a mandatory evacuation was ordered for vulnerable housing in Martin County. Shelters were opened across the region. Officials closed the Miami International Airport, Fort Lauderdale – Hollywood International Airport, Key West International Airport, and Florida Keys Marathon Airport due to the storm. In Monroe and Collier counties, schools were closed, and a shelter was opened in Immokalee. On August 28, Alabama Governor Bob Riley declared a state of emergency for the approaching Hurricane Katrina. On the same day, he requested President Bush to declare "expedited major disaster declaration" for six counties of South Alabama, which was quickly approved. Three-hundred and fifty national guardsmen were called on duty by August 30. The state of Mississippi activated its National Guard on August 26 in preparation for the storm's landfall. Additionally, the state government activated its Emergency Operations Center the next day, and local governments began issuing evacuation orders. By 6:00 pm CDT on August 28, 11 counties and cities issued evacuation orders, a number which increased to 41 counties and 61 cities by the following morning. Moreover, 57 emergency shelters were established on coastal communities, with 31 additional shelters available to open if needed. By Sunday, August 28, most infrastructure along the Gulf Coast had been shut down, including all freight and Amtrak rail traffic into the evacuation areas as well as the Waterford Nuclear Generating Station. 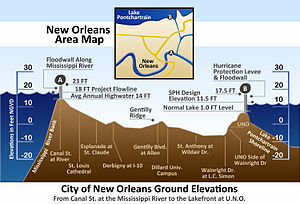 Vertical cross-section of New Orleans, showing maximum levee height of 23 feet (7 m). Vertical scale exaggerated. In Louisiana, the state's hurricane evacuation plan calls for local governments in areas along and near the coast to evacuate in three phases, starting with the immediate coast 50 hours before the start of tropical storm force winds. Persons in areas designated Phase II begin evacuating 40 hours before the onset of tropical storm winds and those in Phase III areas (including New Orleans) evacuate 30 hours before the start of such winds. Many private caregiving facilities that relied on bus companies and ambulance services for evacuation were unable to evacuate their charges because they waited too long. Louisiana's Emergency Operations Plan Supplement 1C (Part II, Section II, Paragraph D) calls for use of school and other public buses in evacuations. Although buses that later flooded were available to transport those dependent upon public transportation, not enough bus drivers were available to drive them as Governor Blanco did not sign an emergency waiver to allow any licensed driver to transport evacuees on school buses. By August 26, the possibility of unprecedented cataclysm was already being considered. Many of the computer models had shifted the potential path of Katrina 150 miles (240 km) westward from the Florida Panhandle, putting the city of New Orleans directly in the center of their track probabilities; the chances of a direct hit were forecast at 17%, with strike probability rising to 29% by August 28. This scenario was considered a potential catastrophe because some parts of New Orleans and the metro area are below sea level. Since the storm surge produced by the hurricane's right-front quadrant (containing the strongest winds) was forecast to be 28 feet (8.5 m), while the levees offered protection to 23 feet (7.0 m), emergency management officials in New Orleans feared that the storm surge could go over the tops of levees protecting the city, causing major flooding. At a news conference at 10 a.m. EDT on August 28, shortly after Katrina was upgraded to a Category 5 storm, New Orleans mayor Ray Nagin ordered the first-ever mandatory evacuation of the city, calling Katrina "a storm that most of us have long feared." The city government also established several "refuges of last resort" for citizens who could not leave the city, including the massive Louisiana Superdome, which sheltered approximately 26,000 people and provided them with food and water for several days as the storm came ashore. Some estimates claimed that 80% of the 1.3 million residents of the greater New Orleans metropolitan area evacuated, leaving behind substantially fewer people than remained in the city during the Hurricane Ivan evacuation. On August 29, Katrina's storm surge caused 53 breaches to various flood protection structures in and around the greater New Orleans area, submerging 80% of the city. A June 2007 report by the American Society of Civil Engineers indicated that two-thirds of the flooding was caused by the multiple failures of the city's floodwalls. The storm surge also devastated the coasts of Mississippi and Alabama, making Katrina one of the most destructive hurricanes, the costliest natural disaster in the history of the United States, tied with Hurricane Harvey in 2017, and the deadliest hurricane since the 1928 Okeechobee hurricane. The total damage from Katrina is estimated at $125 billion (2005 U.S. dollars). The death toll from Katrina is uncertain, with reports differing by hundreds. According to the National Hurricane Center, 1,836 fatalities can be attributed to the storm: 1 in Kentucky, 2 each in Alabama, Georgia, and Ohio, 14 in Florida, 238 in Mississippi, and 1,577 in Louisiana. However, 135 people remain categorized as missing in Louisiana, and many of the deaths are indirect, but it is almost impossible to determine the exact cause of some of the fatalities. A 2008 report by the Disaster Medicine and Public Health Preparedness journal indicates that 966 deaths can be directly attributed to the storm in Louisiana, including out of state evacuees, and another 20 indirectly (such as firearm-related deaths and gas poisoning). Due to uncertain causes of death with 454 evacuees, an upper-bound of 1,440 is noted in the paper. A follow-up study by the Louisiana Department of Health & Hospitals determined that the storm was directly responsible for 1,170 fatalities in Louisiana. Federal disaster declarations covered 90,000 square miles (230,000 km2) of the United States, an area almost as large as the United Kingdom. The hurricane left an estimated three million people without electricity. On September 3, 2005, Homeland Security Secretary Michael Chertoff described the aftermath of Hurricane Katrina as "probably the worst catastrophe or set of catastrophes," in the country's history, referring to the hurricane itself plus the flooding of New Orleans. Even in 2010, debris remained in some coastal communities. Hurricane Katrina first made landfall between Hallandale Beach and Aventura, Florida on August 25. The storm dropped heavy rainfall in portions of the Miami metropolitan area, with a peak total of 16.43 in (417 mm) in Perrine. As a result, local flooding occurred in Miami-Dade County, damaging approximately 100 homes. Farther south in the Florida Keys, a tornado was spawned in Marathon on August 26. The tornado damaged a hangar at the airport there and caused an estimated $5 million in damage. The rains caused flooding, and the combination of rains and winds downed trees and power lines, leaving 1.45 million people without power. Damage in South Florida was estimated at $523 million, mostly as a result of crop damage. Twelve deaths occurred in South Florida, of which three were caused by downed trees in Broward County, three from drowning in Miami-Dade County, three were from carbon monoxide poisoning caused by generators, one was due to a vehicle accident, one occurred during debris cleanup, and one was associated with a lack of electricity. Significant impacts were also reported in the Florida Panhandle. Although Katrina moved ashore in Louisiana and Mississippi, its outer periphery produced a 5.37 ft (1.64 m) storm surge in Pensacola. High waves caused beach erosion and closed nearby roadways. There were five tornadoes in the northwestern portion of the state, though none of them caused significant damage. Throughout the Florida Panhandle, the storm resulted in an estimated $100 million in damage. There were two indirect fatalities from Katrina in Walton County as a result of a traffic accident. In the Florida Panhandle, 77,000 customers lost power. Overall, the hurricane killed 14 people and caused at least $623 million in damage. Before striking South Florida, Katrina traversed the Bahamas as a tropical storm. However, minimal impact was reported, with only "fresh breezes" on various islands. Although Hurricane Katrina stayed well to the north of Cuba, on August 29 it brought tropical-storm force winds and rainfall of over 8 in (200 mm) to western regions of the island. Telephone and power lines were damaged and around 8,000 people were evacuated in the Pinar del Río Province. According to Cuban television reports the coastal town of Surgidero de Batabanó was 90% underwater. On August 29, Hurricane Katrina made landfall near Buras-Triumph, Louisiana, with 125 mph (200 km/h) winds, a strong Category 3 storm. However, as it had only just weakened from Category 4 strength and the radius of maximum winds was large, it is possible that sustained winds of Category 4 strength briefly impacted extreme southeastern Louisiana. Although the storm surge to the east of the path of the eye in Mississippi was higher, a very significant surge affected the Louisiana coast. The height of the surge is uncertain because of a lack of data, although a tide gauge in Plaquemines Parish indicated a storm tide in excess of 14 feet (4.3 m) and a 12-foot (3.7 m) storm surge was recorded in Grand Isle. 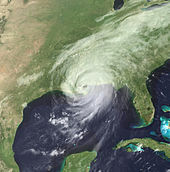 Hurricane Katrina made final landfall near the mouth of the Pearl River, with the eye straddling St. Tammany Parish, Louisiana, and Hancock County, Mississippi, on the morning of August 29 at about 9:45M CST. Hurricane Katrina also brought heavy rain to Louisiana, with 8–10 inches (200–250 mm) falling on a wide swath of the eastern part of the state. In the area around Slidell, the rainfall was even higher, and the highest rainfall recorded in the state was approximately 15 inches (380 mm). As a result of the rainfall and storm surge the level of Lake Pontchartrain rose and caused significant flooding along its northeastern shore, affecting communities from Slidell to Mandeville. Several bridges were destroyed, including the I-10 Twin Span Bridge connecting Slidell to New Orleans. Almost 900,000 people in Louisiana lost power as a result of Hurricane Katrina. Katrina's storm surge inundated all parishes surrounding Lake Pontchartrain, including St. Tammany, Tangipahoa, St. John the Baptist, and St. Charles Parishes. St. Tammany Parish received a two-part storm surge. The first surge came as Lake Pontchartrain rose and the storm blew water from the Gulf of Mexico into the lake. The second came as the eye of Katrina passed, westerly winds pushed water into a bottleneck at the Rigolets Pass, forcing it farther inland. The range of surge levels in eastern St. Tammany Parish is estimated at 13–16 feet (4.0–4.9 m), not including wave action. Hard-hit St. Bernard Parish was flooded because of breaching of the levees that contained a navigation channel called the Mississippi River Gulf Outlet (MR-GO) and the breach of the 40 Arpent canal levee that was designed and built by the Orleans Levee Board. The search for the missing was undertaken by the St. Bernard Fire Department because of the assets of the United States Coast Guard being diverted to New Orleans. In the months after the storm, many of the missing were tracked down by searching flooded homes, tracking credit card records, and visiting homes of family and relatives. Hurricane Katrina making landfall in New Orleans, Louisiana. According to the U.S. Dept. of Housing and Urban Development, in St. Bernard Parish, 81% (20,229) of the housing units were damaged. In St. Tammany Parish, 70% (48,792) were damaged and in Plaquemines Parish 80% (7,212) were damaged. In addition, the combined effect of Hurricanes Katrina and Rita was the destruction of an estimated 562 square kilometres (217 sq mi) of coastal wetlands in Louisiana. As the eye of Hurricane Katrina swept to the northeast, it subjected the city to hurricane conditions for hours. Although power failures prevented accurate measurement of wind speeds in New Orleans, there were a few measurements of hurricane-force winds. From this the NHC concluded that it is likely that much of the city experienced sustained winds of Category 1 or Category 2 strength. Katrina's storm surge led to 53 levee breaches in the federally built levee system protecting metro New Orleans and the failure of the 40 Arpent Canal levee. Many levees in metro New Orleans were breached as Hurricane Katrina passed just east of the city limits. There were no breaches of Mississippi River levees in metro New Orleans. Failures occurred in New Orleans and surrounding communities, especially St. Bernard Parish. The Mississippi River Gulf Outlet (MR-GO) breached its levees in approximately 20 places, flooding much of eastern New Orleans, most of St. Bernard Parish and the East Bank of Plaquemines Parish. The major levee breaches in the city included breaches at the 17th Street Canal levee, the London Avenue Canal, and the wide, navigable Industrial Canal, which left approximately 80% of the city flooded. Most of the major roads traveling into and out of the city were damaged. The only major highway routes out of the city were the westbound Crescent City Connection and the Huey P. Long Bridge, as large portions of the I-10 Twin Span Bridge traveling eastbound towards Slidell, Louisiana had collapsed. Both the Lake Pontchartrain Causeway and the Crescent City Connection only carried emergency traffic. However, access to downtown New Orleans and the "shelter of last resort" at the Convention Center was never closed because River Road in Jefferson Parish and Leake Avenue and Tchoupitoulas Street in New Orleans were not flooded, and would have allowed access throughout the immediate post-storm emergency period. On August 29, at 7:40 am CDT, it was reported that most of the windows on the north side of the Hyatt Regency New Orleans had been blown out, and many other high rise buildings had extensive window damage. The Hyatt was the most severely damaged hotel in the city, with beds reported to be flying out of the windows. Insulation tubes were exposed as the hotel's glass exterior was completely sheared off. The Superdome, which was sheltering many people who had not evacuated, sustained significant damage. Two sections of the Superdome's roof were compromised and the dome's waterproof membrane had essentially been peeled off. Louis Armstrong New Orleans International Airport was closed before the storm but did not flood. On August 30, it was reopened to humanitarian and rescue operations. Limited commercial passenger service resumed at the airport on September 13 and regular carrier operations resumed in early October. Levee breaches in New Orleans also caused a significant number of deaths, with over 700 bodies recovered in New Orleans by October 23, 2005. Some survivors and evacuees reported seeing dead bodies lying in city streets and floating in still-flooded sections, especially in the east of the city. The advanced state of decomposition of many corpses, some of which were left in the water or sun for days before being collected, hindered efforts by coroners to identify many of the dead. A U.S. Coast Guardsman searches for survivors in New Orleans in the Katrina aftermath. The first deaths reported from the city were reported shortly before midnight on August 28, as three nursing home patients died during an evacuation to Baton Rouge, most likely from dehydration. An estimated 215 bodies were found in nursing homes and hospitals in New Orleans, the largest number being at Memorial Medical Center where 45 corpses were recovered. Some 200 patients at Charity Hospital were not evacuated until Friday, September 2, having been without power or fresh water for five days. While there were also early reports of fatalities amid mayhem at the Superdome, only six deaths were confirmed there, with four of these originating from natural causes, one from a drug overdose, and one a suicide. At the Convention Center, four bodies were recovered. One of the four is believed to be the result of a homicide. There is evidence that many prisoners were abandoned in their cells during the storm, while the guards sought shelter. Hundreds of prisoners were later registered as "unaccounted for". U.S. Route 90's Bay St. Louis Bridge on Pass Christian was destroyed as a result of Katrina. The Gulf coast of Mississippi suffered massive damage from the impact of Hurricane Katrina on August 29, leaving 238 people dead, 67 missing, and billions of dollars in damage: bridges, barges, boats, piers, houses, and cars were washed inland. Katrina traveled up the entire state, and afterward, all 82 counties in Mississippi were declared disaster areas for federal assistance, 47 for full assistance. After making a brief initial landfall in Louisiana, Katrina had made its final landfall near the state line, and the eyewall passed over the cities of Bay St. Louis and Waveland as a Category 3 hurricane with sustained winds of 120 mph (190 km/h). Katrina's powerful right-front quadrant passed over the west and central Mississippi coast, causing a powerful 27-foot (8.2 m) storm surge, which penetrated 6 miles (10 km) inland in many areas and up to 12 miles (19 km) inland along bays and rivers; in some areas, the surge crossed Interstate 10 for several miles. Hurricane Katrina brought strong winds to Mississippi, which caused significant tree damage throughout the state. The highest unofficial reported wind gust recorded from Katrina was one of 135 mph (217 km/h) in Poplarville, in Pearl River County. The storm also brought heavy rains with 8–10 inches (200–250 mm) falling in southwestern Mississippi and rain in excess of 4 inches (100 mm) falling throughout the majority of the state. Katrina caused eleven tornadoes in Mississippi on August 29, some of which damaged trees and power lines. Battered by wind, rain and storm surge, some beachfront neighborhoods were completely leveled. Preliminary estimates by Mississippi officials calculated that 90% of the structures within half a mile of the coastline were completely destroyed, and that storm surges traveled as much as 6 miles (10 km) inland in portions of the state's coast. One apartment complex with approximately thirty residents seeking shelter inside collapsed. More than half of the 13 casinos in the state, which were floated on barges to comply with Mississippi land-based gambling laws, were washed hundreds of yards inland by waves. A number of streets and bridges were washed away. On U.S. Highway 90 along the Mississippi Gulf Coast, two major bridges were completely destroyed: the Bay St. Louis–Pass Christian bridge, and the Biloxi–Ocean Springs bridge. In addition, the eastbound span of the I-10 bridge over the Pascagoula River estuary was damaged. In the weeks after the storm, with the connectivity of the coastal U.S. Highway 90 shattered, traffic traveling parallel to the coast was reduced first to State Road 11 (parallel to I-10) then to two lanes on the remaining I-10 span when it was opened. All three coastal counties of the state were severely affected by the storm. 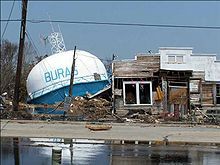 Katrina's surge was the most extensive, as well as the highest, in the documented history of the United States; large portions of Hancock, Harrison and Jackson counties were inundated by the storm surge, in all three cases affecting most of the populated areas. Surge covered almost the entire lower half of Hancock County, destroying the coastal communities of Clermont Harbor and Waveland, much of Bay St. Louis, and flowed up the Jourdan River, flooding Diamondhead and Kiln. In Harrison County, Pass Christian was completely inundated, along with a narrow strip of land to the east along the coast, which includes the cities of Long Beach and Gulfport; the flooding was more extensive in communities such as D'Iberville, which borders Back Bay. Biloxi, on a peninsula between the Back Bay and the coast, was particularly hard hit, especially the low-lying Point Cadet area. In Jackson County, storm surge flowed up the wide river estuary, with the combined surge and freshwater flooding cutting the county in half. Remarkably, over 90% of Pascagoula, the easternmost coastal city in Mississippi, and about 75 miles (120 km) east of Katrina's landfall near the Louisiana-Mississippi border was flooded from storm surge at the height of the storm. Other large Jackson County neighborhoods such as Porteaux Bay and Gulf Hills were severely damaged with large portions being completely destroyed, and St. Martin was hard hit; Ocean Springs, Moss Point, Gautier and Escatawpa also suffered major surge damage. Mississippi Emergency Management Agency officials also recorded deaths in Forrest, Hinds, Warren, and Leake counties. Over 900,000 people throughout the state experienced power outages. Flood waters come up the steps of Mobile's federal courthouse. Although Hurricane Katrina made landfall well to the west, Alabama and the Florida Panhandle were both affected by tropical-storm force winds and a storm surge varying from 12 to 16 feet (3.7–4.9 m) around Mobile Bay, with higher waves on top. Sustained winds of 67 mph (108 km/h) were recorded in Mobile, Alabama, and the storm surge there was approximately 12 feet (3.7 m). The surge caused significant flooding several miles inland along Mobile Bay. Four tornadoes were also reported in Alabama. Ships, oil rigs, boats and fishing piers were washed ashore along Mobile Bay: the cargo ship M/V Caribbean Clipper and many fishing boats were grounded at Bayou La Batre. An oil rig under construction along the Mobile River broke its moorings and floated 1.5 miles (2.4 km) northwards before striking the Cochrane Bridge just outside Mobile. No significant damage resulted to the bridge and it was soon reopened. The damage on Dauphin Island was severe, with the surge destroying many houses and cutting a new canal through the western portion of the island. An offshore oil rig also became grounded on the island. As in Mississippi, the storm surge caused significant beach erosion along the Alabama coastline. More than 600,000 people lost power in Alabama as a result of Hurricane Katrina and two people died in a traffic accident in the state. Residents in some areas, such as Selma, were without power for several days. Northern and central Georgia were affected by heavy rains and strong winds from Hurricane Katrina as the storm moved inland, with more than 3 inches (75 mm) of rain falling in several areas. At least 18 tornadoes formed in Georgia on August 29, the most on record in that state for one day in August. The most serious of these tornadoes was an F2 tornado which affected Heard County and Carroll County. This tornado caused three injuries and one fatality and damaged several houses. The other tornadoes caused significant damages to buildings and agricultural facilities. In addition to the fatality caused by the F2 tornado, there was another fatality in a traffic accident. Eastern Arkansas received light rain from the passage of Katrina. Gusty winds downed some trees and power lines, though damage was minimal. Katrina also caused a number of power outages in many areas, with over 100,000 customers affected in Tennessee, primarily in the Memphis and Nashville areas. Total rainfall from Katrina in the United States. Data for the New Orleans area is not available. In Kentucky, a storm that had moved through the weekend before had already produced flooding and the rainfall from Katrina added to this. A 10-year-old girl drowned in Hopkinsville. Dozens of business were closed and several families evacuated due to rising flood waters. As a result of the flooding, Kentucky Governor Ernie Fletcher declared three counties disaster areas and a statewide state of emergency. Additionally, wind gusts up to 72 mph (116 km/h) resulted in some damage. Downed trees and power lines were reported in several counties in western Kentucky, especially Calloway and Christian counties. Overall, more than 10,000 utility customers in western Kentucky experienced power outages. The remnants of Katrina spawned a tornado in Virginia, damaging at least 13 homes in Marshall. In addition, approximately 4,000 people lost electricity. Over 3 in (76 mm) of rain fell in portions of West Virginia, causing localized flooding in several counties. At least 103 homes and 7 buildings suffered some degree of water damage. A number of roads and bridges were inundated or washed out. The remnants of Katrina produced locally heavy precipitation in northeast Ohio, ranging from about 2 to 4 in (51 to 102 mm). Numerous streams and rivers overflowed their banks, forcing the closure of several roads, including Interstate 90 in Cleveland. Two deaths occurred due to a flood-related automobile accident in Huron County. Additionally, hundreds of homes and businesses suffered flood damage. Katrina spawned five tornadoes in Pennsylvania, though none resulted in significant damage. Up to 5 in (130 mm) of rain fell in western New York. Gusty winds also left approximately 4,500 people in Buffalo without electricity. The remnants of Katrina brought 3 to 6 in (76 to 152 mm) of rain to portions of Massachusetts, causing flash flooding in Bristol and Plymouth counties. Several roads were closed due to floodwater inundation in Acushnet, Dartmouth, New Bedford, and Wareham, including Route 18 in New Bedford. Very minimal impact was reported in Rhode Island, with winds downing a tree and two electrical poles in the city of Warwick. In Vermont, 2.5 in (64 mm) of rain in Chittenden County caused cars to hydroplane on Interstate 89, resulting in many automobile accidents. The storm brought 3 to 5 in (76 to 127 mm) of precipitation to isolated areas of Maine and up to 9 in (230 mm) near Patten. Several roads were inundated or washed out by overflowing brooks and streams, including sections of U.S. Route 1 and Maine routes 11 and 159. Several structures and one parked vehicle were also affected by the waters. Wind gusts up to 60 mph (97 km/h) also impacted parts of Maine, felling trees and causing power outages in Bar Harbor, Blue Hill, Dover-Foxcroft, Sedgwick Ridge, and Sorrento. In Canada, the remnants of Katrina brought rainfall amounts in excess of 3.94 in (100 mm) to many locations between the Niagara Peninsula and the Saint Lawrence River valley. Severe local flooding occurred in Quebec, forcing the evacuations of dozens of homes in some communities as rivers began overflowing their banks and sewage systems were becoming overwhelmed by the influx of precipitation. Inundated and washed out roads, including Route 138 along the north shore of the Saint Lawrence River, Route 172 north of Tadoussac, and Route 385 near Forestville left several communities isolated for at least a week. The economic effects of the storm reached high levels. The Bush Administration sought $105 billion for repairs and reconstruction in the region, which did not account for damage to the economy caused by potential interruption of the oil supply, destruction of the Gulf Coast's highway infrastructure, and exports of commodities such as grain. Katrina damaged or destroyed 30 oil platforms and caused the closure of nine refineries; the total shut-in oil production from the Gulf of Mexico in the six-month period following Katrina was approximately 24% of the annual production and the shut-in gas production for the same period was about 18%. The forestry industry in Mississippi was also affected, as 1.3 million acres (5,300 km2) of forest lands were destroyed. The total loss to the forestry industry from Katrina is calculated to rise to about $5 billion. Furthermore, hundreds of thousands of local residents were left unemployed. Before the hurricane, the region supported approximately one million non-farm jobs, with 600,000 of them in New Orleans. It is estimated that the total economic impact in Louisiana and Mississippi may eventually exceed $150 billion. Forensic accountants were involved in the assessment of economic damages resulting from this catastrophe. Katrina displaced over one million people from the central Gulf coast to elsewhere across the United States, becoming the largest diaspora in the history of the United States. Houston, Texas, had an increase of 35,000 people; Mobile, Alabama, gained over 24,000; Baton Rouge, Louisiana, over 15,000; and Hammond, Louisiana, received over 10,000, nearly doubling its size. Chicago, Illinois received over 6,000 people, the most of any non-southern city. By late January 2006, about 200,000 people were once again living in New Orleans, less than half of the pre-storm population. By July 1, 2006, when new population estimates were calculated by the U.S. Census Bureau, the state of Louisiana showed a population decline of 219,563 or 4.87%. Additionally, some insurance companies have stopped insuring homeowners in the area because of the high costs from Hurricanes Katrina and Rita, or have raised homeowners' insurance premiums to cover their risk. Katrina also had a profound impact on the environment. The storm surge caused substantial beach erosion, in some cases completely devastating coastal areas. In Dauphin Island (a barrier island), approximately 90 mi (140 km) to the east of the point where the hurricane made landfall, the sand that comprised the island was transported across the island into the Mississippi Sound, pushing the island towards land. The storm surge and waves from Katrina also severely damaged the Chandeleur Islands, which had been affected by Hurricane Ivan the previous year. The US Geological Survey has estimated 217 sq mi (560 km2) of land was transformed to water by the hurricanes Katrina and Rita. Before the storm, subsidence and erosion caused loss of land in the Louisiana wetlands and bayous. This, along with the canals built in the area, let Katrina keep more of its intensity when it struck. The lands that were lost were breeding grounds for marine mammals, brown pelicans, turtles, and fish, and migratory species such as redhead ducks. Overall, about 20% of the local marshes were permanently overrun by water as a result of the storm. The damage from Katrina forced the closure of 16 National Wildlife Refuges. Breton National Wildlife Refuge lost half its area in the storm. As a result, the hurricane affected the habitats of sea turtles, Mississippi sandhill cranes, Red-cockaded woodpeckers, and Alabama Beach mice. Katrina also produced massive tree loss along the Gulf Coast, particularly in Louisiana's Pearl River Basin and among bottomland hardwood forests. Before the storm, the standard mortality rate for the area's trees was 1.9%, but this interval increased to 20.5% by the end of 2006. Delayed mortality as an effect of the storm continued with rates up to 5% until 2011. This significant loss in biomass caused greater decay and an increase in carbon emissions. For example, by 2006 the decreased biomass in bottomland hardwood forests contributed an amount of carbon which equated to roughly 140% of the net annual U.S. carbon sink in forest trees. The storm caused oil spills from 44 facilities throughout southeastern Louisiana, which resulted in over 7 million US gallons (26,000 m3) of oil being leaked. Some spills were only a few hundred gallons and most were contained on-site, though some oil entered the ecosystem and residential areas. After a spill at the Murphy Oil refinery, for example, 1,800 homes were oiled in the towns of Chalmette and Meraux. Unlike Hurricane Ivan, no offshore oil spills were officially reported after Hurricane Katrina. However, Skytruth reported some signs of surface oil in the Gulf of Mexico. Finally, as part of the cleanup effort, the flood waters that covered New Orleans were pumped into Lake Pontchartrain, a process that took 43 days to complete. These residual waters contained a mix of raw sewage, bacteria, heavy metals, pesticides, toxic chemicals, and oil, which sparked fears in the scientific community of massive numbers of fish dying. U.S. Army Infantry on patrol in New Orleans in an area previously underwater, September 2005. Shortly after the hurricane moved away on August 30, 2005, some residents of New Orleans who remained in the city began looting stores. Many were in search of food and water that were not available to them through any other means, as well as non-essential items. Additionally, there were reports of carjacking, murders, thefts, and rapes in New Orleans. Some sources later determined that many of the reports were inaccurate, greatly exaggerated or completely false, leading news agencies to print retractions. Thousands of National Guard and federal troops were mobilized and sent to Louisiana, with 7,841 in the area on August 29, to a maximum of 46,838 on September 10. A number of local law enforcement agents from across the country were temporarily deputized by the state. "They have M16s and are locked and loaded. These troops know how to shoot and kill and I expect they will," Louisiana Governor Kathleen Blanco said. Congressman Bill Jefferson told ABC News: "There was shooting going on. There was sniping going on. Over the first week of September, law and order were gradually restored to the city." Several shootings occurred between police and New Orleans residents, some involving police misconduct; including an incident that killed two unarmed civilians and seriously injured four others at Danziger Bridge. Five former police officers pleaded guilty to charges connected to the Danziger Bridge shootings in the aftermath of the hurricane. Six other former or current officers appeared in court in June 2011. Overall, a number of arrests were made throughout the affected area, including some near the New Orleans Convention Center. A temporary jail was constructed of chain link cages in the New Orleans Union Passenger Terminal, the city's main train station. In West Virginia, where roughly 350 refugees were located, local officials took fingerprints to run criminal background checks on the refugees. The background checks found that 45% of the refugees had a criminal record of some nature, and that 22% had a violent criminal record. Media speculation fueled a popular perception that the displaced New Orleans residents brought a wave of crime into the communities where they relocated, however, detailed studies of crime statistics in these communities did not reveal a significant increase in violent crime. Within the United States and as delineated in the National Response Plan, disaster response and planning is first and foremost a local government responsibility. When local government exhausts its resources, it then requests specific additional resources from the county level. The request process proceeds similarly from the county to the state to the federal government as additional resource needs are identified. Many of the problems that arose developed from inadequate planning and back-up communication systems at various levels. Of the 60,000 people stranded in New Orleans, the Coast Guard rescued more than 33,500. Congress recognized the Coast Guard's response with an official entry in the Congressional Record, and the Armed Service was awarded the Presidential Unit Citation. The United States Northern Command established Joint Task Force (JTF) Katrina based out of Camp Shelby, Mississippi, to act as the military's on-scene response on Sunday, August 28, with US Army Lieutenant General Russel L. Honoré as commander. Approximately 58,000 National Guard personnel were activated to deal with the storm's aftermath, with troops coming from all 50 states. The Department of Defense also activated volunteer members of the Civil Air Patrol. Michael Chertoff, Secretary of the Department of Homeland Security, decided to take over the federal, state, and local operations officially on August 30, 2005, citing the National Response Plan. This was refused by Governor Blanco who indicated that her National Guard could manage. Early in September, Congress authorized a total of $62.3 billion in aid for victims. Additionally, President Bush enlisted the help of former presidents Bill Clinton and George H. W. Bush to raise additional voluntary contributions, much as they did after the 2004 Indian Ocean earthquake and tsunami. American flags were also ordered to be half-staff from September 2, 2005, to September 20, 2005, in honor of the victims. FEMA provided housing assistance (rental assistance, trailers, etc.) to more than 700,000 applicants—families and individuals. However, only one-fifth of the trailers requested in Orleans Parish were supplied, resulting in an enormous housing shortage in the city of New Orleans. Many local areas voted to not allow the trailers, and many areas had no utilities, a requirement prior to placing the trailers. To provide for additional housing, FEMA has also paid for the hotel costs of 12,000 individuals and families displaced by Katrina through February 7, 2006, when a final deadline was set for the end of hotel cost coverage. After this deadline, evacuees were still eligible to receive federal assistance, which could be used towards either apartment rent, additional hotel stays, or fixing their ruined homes, although FEMA no longer paid for hotels directly. As of March 30, 2010, there were still 260 families living in FEMA-provided trailers in Louisiana and Mississippi. Law enforcement and public safety agencies, from across the United States, provided a "mutual aid" response to Louisiana and New Orleans in the weeks following the disaster. Many agencies responded with manpower and equipment from as far away as California, Michigan, Nevada, New York, and Texas. This response was welcomed by local Louisiana authorities as their staff were either becoming fatigued, stretched too thin, or even quitting from the job. Two weeks after the storm, more than half of the states were involved in providing shelter for evacuees. By four weeks after the storm, evacuees had been registered in all 50 states and in 18,700 zip codes—half of the nation's residential postal zones. Most evacuees had stayed within 250 miles (400 km), but 240,000 households went to Houston and other cities over 250 miles (400 km) away and another 60,000 households went over 750 miles (1,200 km) away. USNS Comfort takes on supplies at Mayport, Florida, en route to the Gulf Coast. The criticisms of the government's response to Hurricane Katrina primarily consisted of criticism of mismanagement and lack of leadership in the relief efforts in response to the storm and its aftermath. More specifically, the criticism focused on the delayed response to the flooding of New Orleans, and the subsequent state of chaos in the city. The neologism Katrinagate was coined to refer to this controversy, and was a runner-up for "2005 word of the year." Within days of Katrina's August 29 landfall, public debate arose about the local, state and federal governments' role in the preparations for and response to the hurricane. Criticism was initially prompted by televised images of visibly shaken and frustrated political leaders, and of residents who remained stranded by flood waters without water, food, or shelter. Deaths from thirst, exhaustion and violence days after the storm had passed fueled the criticism, as did the dilemma of the evacuees at facilities such as the Louisiana Superdome and the New Orleans Civic Center. Some alleged that race, class, and other factors could have contributed to delays in government response. For example, during A Concert for Hurricane Relief, a benefit concert for victims of the hurricane, rapper Kanye West veered off script and harshly criticized the government's response to the crisis, stating that "George Bush doesn't care about black people." In accordance with federal law, President George W. Bush directed the Secretary of the Department of Homeland Security, Michael Chertoff, to coordinate the Federal response. Chertoff designated Michael D. Brown, head of the Federal Emergency Management Agency, as the Principal Federal Official to lead the deployment and coordination of all federal response resources and forces in the Gulf Coast region. However, the President and Secretary Chertoff initially came under harsh criticism for what some perceived as a lack of planning and coordination. Brown claimed that Governor Blanco resisted their efforts and was unhelpful. Governor Blanco and her staff disputed this. Eight days later, Brown was recalled to Washington and Coast Guard Vice Admiral Thad W. Allen replaced him as chief of hurricane relief operations. Three days after the recall, Michael D. Brown resigned as director of FEMA in spite of having received recent praise from President Bush. Politicians, activists, pundits, and journalists also directed criticism at the local and state governments headed by Mayor Nagin of New Orleans and Louisiana Governor Blanco. Nagin and Blanco were criticized for failing to implement New Orleans' evacuation plan and for ordering residents to a shelter of last resort without any provisions for food, water, security, or sanitary conditions. Perhaps the most important criticism of Nagin was that he delayed his emergency evacuation order until 19 hours before landfall, which led to hundreds of deaths of people who could not find any way out of the city. The destruction wrought by Hurricane Katrina raised other, more general public policy issues about emergency management, environmental policy, poverty, and unemployment. The discussion of both the immediate response and of the broader public policy issues may have affected elections and legislation enacted at various levels of government. The storm's devastation also prompted a Congressional investigation, which found that FEMA and the Red Cross "did not have a logistics capacity sophisticated enough to fully support the massive number of Gulf coast victims." Additionally, it placed responsibility for the disaster on all three levels of government. An ABC News poll conducted on September 2, 2005, showed more blame was being directed at state and local governments (75%) than at the Federal government (67%), with 44% blaming Bush's leadership directly. A later CNN/USAToday/Gallup poll showed that respondents disagreed widely on who was to blame for the problems in the city following the hurricane — 13% said Bush, 18% said federal agencies, 25% blamed state or local officials and 38% said no one was to blame. United States Navy personnel unload Canadian relief supplies from a Royal Canadian Air Force transport aircraft in Pensacola, Florida. Over seventy countries pledged monetary donations or other assistance. Cuba and Venezuela (both considered as hostile to US government interest) were the first countries to offer assistance, pledging over $1 million, several mobile hospitals, water treatment plants, canned food, bottled water, heating oil, 1,100 doctors and 26.4 metric tons of medicine, though this aid was rejected by the U.S. government. Kuwait made the largest single pledge, $500 million; other large donations were made by Qatar and United Arab Emirates (each $100 million), South Korea ($30 million), Australia ($10 million), India, China (both $5 million), New Zealand ($2 million), Pakistan ($1.5 million), Norway ($1.8 million), and Bangladesh ($1 million). India sent tarps, blankets, and hygiene kits. An Indian Air Force IL-76 aircraft delivered 25 tonnes of relief supplies for the Hurricane Katrina victims at the Little Rock Air Force Base, Arkansas, on September 13, 2005. Israel sent an IDF delegation to New Orleans to transport aid equipment including 80 tons of food, disposable diapers, beds, blankets, generators and additional equipment which were donated from different governmental institutions, civilian institutions, and the IDF. The Bush Administration announced in mid-September that it did not need Israeli divers and physicians to come to the United States for search and rescue missions, but a small team landed in New Orleans on September 10 to give assistance to operations already under way. The team administered first aid to survivors, rescued abandoned pets and discovered hurricane victims. Countries like Sri Lanka, which was still recovering from the Indian Ocean Tsunami, also offered to help. Countries including Canada, Mexico, Singapore, and Germany sent supplies, relief personnel (like Technisches Hilfswerk), troops, ships and water pumps to aid in the disaster recovery. Belgium sent in a team of relief personnel. Britain's donation of 350,000 emergency meals did not reach victims because of laws regarding mad cow disease. Russia's initial offer of two jets was declined by the U.S. State Department but accepted later. The French offer was also declined and requested later. Residents of Louisiana, who had to flee their homes because of Hurricane Katrina, are inside the Houston Astrodome and being helped by the Red Cross and other agencies and associations. The American Red Cross, America's Second Harvest (now known as Feeding America), Southern Baptist Convention, Salvation Army, Oxfam, Common Ground Collective, Burners Without Borders, Emergency Communities, Habitat for Humanity, Catholic Charities, Direct Relief, Service International, "A River of Hope", The Church of Jesus Christ of Latter-day Saints, and many other charitable organizations provided aid to victims in the aftermath of the storm. 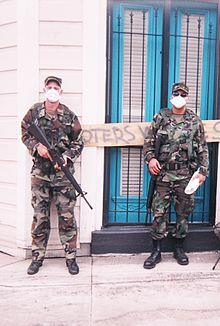 They were not allowed into New Orleans proper by the National Guard for several days after the storm because of safety concerns. These organizations raised US$4.25 billion in donations from the public, with the Red Cross receiving over half of these donations. Some smaller organizations and individuals ignored the access restrictions and provided early relief. For example, two privately chartered planes from FasterCures evacuated 200 patients from Charity Hospital in New Orleans. Volunteers from the Amateur Radio Emergency Service provided communications in areas where the communications infrastructure had been damaged or totally destroyed, relaying everything from 911 traffic to messages home. In Hancock County, Mississippi, ham radio operators provided the only communications into or out of the area and even served as 911 dispatchers. Many private corporations also contributed to relief efforts. On September 13, 2005, it was reported that corporate donations amounted to $409 million, and were expected to exceed $1 billion. During and after the Hurricanes Katrina, Wilma and Rita, the American Red Cross had opened 1,470 shelters and registered 3.8 million overnight stays. None were allowed in New Orleans, however. A total of 244,000 Red Cross workers (95% of which were non-paid volunteers) were utilized throughout these three hurricanes. In addition, 346,980 comfort kits (including such basic necessities as toothpaste, soap, washcloths, and toys for children) and 205,360 cleanup kits (containing brooms, mops, and bleach) were distributed. For mass care, the organization served 68 million snacks and meals to victims of the disasters and to rescue workers. The Red Cross also had its Disaster Health services meet 596,810 contacts, and Disaster Mental Health services met 826,590 contacts. Red Cross emergency financial assistance was provided to 1.4 million families. Hurricane Katrina was the first natural disaster in the United States in which the American Red Cross utilized its "Safe and Well" family location website. Direct Relief provided a major response in the Gulf states so health providers could treat the local patients and evacuees. Direct Relief furnished $10 million in medical material aid and cash grants to support clinics and health centers in the area. In the year following Katrina's strike on the Gulf Coast, The Salvation Army allocated donations of more than $365 million to serve more than 1.7 million people in nearly every state. The organization's immediate response to Hurricane Katrina included more than 5.7 million hot meals and about 8.3 million sandwiches, snacks, and drinks served in and around New Orleans. Its SATERN network of amateur radio operators picked up where modern communications left off to help locate more than 25,000 survivors. Salvation Army pastoral care counselors were on hand to comfort the emotional and spiritual needs of 277,000 individuals. As part of the overall effort, Salvation Army officers, employees, and volunteers contributed more than 900,000 hours of service. According to a modeling exercise conducted by the U.S. Army Corps of Engineers (USACE), two-thirds of the deaths in Greater New Orleans were due to levee and flood wall failure. On April 5, 2006, months after independent investigators had demonstrated that levee failures were not caused by natural forces beyond intended design strength, Lieutenant General Carl Strock, Chief of Engineers and Commander of the Corps of Engineers, testified before the United States Senate Subcommittee on Energy and Water that "We have now concluded we had problems with the design of the structure." 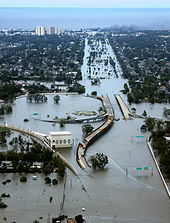 A June 2007 report released by the American Society of Civil Engineers determined that the failures of the levees and flood walls in New Orleans were found to be primarily the result of system design and construction flaws. The U.S. Army Corps of Engineers had been federally mandated in the Flood Control Act of 1965 with responsibility for the conception, design, and construction of the region's flood-control system. All of the major studies in the aftermath of Katrina concluded that the USACE was responsible for the failure of the levees. This was primarily attributed to a decision to use shorter steel sheet pilings during construction in an effort to save money. According to a report published in August 2015 in the official journal of the World Water Council, the Corps misinterpreted the results of a 1985 study and wrongly concluded that sheet piles in the flood walls needed to be driven to depths of only 17 feet (5 m) instead of between 31 and 46 feet (9 and 14 m). That decision saved approximately US$100 million, but significantly reduced overall engineering reliability. In January 2008, Judge Stanwood Duval of the U.S. District Court ruled that despite the Corps' role in the flooding, the agency could not be held financially liable because of sovereign immunity in the Flood Control Act of 1928. Exactly ten years after Katrina, J. David Rogers, lead author of a new report in the official journal of the World Water Council, concluded that the flooding during Katrina "could have been prevented had the corps retained an external review board to double-check its flood-wall designs." Storm surge pushing across shallow Lake Borgne from the east is constrained by these MRGO levees to the south and, to the north, by the long-standing levees of the Intracoastal Waterway (GIWW). Initially ten or more miles apart, these two channels meet, and when they do, the water building between their levees is squeezed into a single channel – the Funnel – only 260 yards wide, constrained by levees 14 feet to 16 feet high….In concert with the denuded marshes, it could increase the local storm surge hitting the Intracoastal Waterway by 20 percent to 40 percent – a critical and fundamental flaw. The Corps of Engineers disputes these causalities. Nonetheless, in June 2008, the Army Corps of Engineers New Orleans District submitted a Deep-Draft De-authorization Study of the MRGO which stated that "an economic evaluation of channel navigation use does not demonstrate a Federal interest in continued operation and maintenance of the channel." Congress ordered the MRGO closed as a direct result. Many of the levees have been reconstructed since Katrina. In reconstructing them, precautions were taken to bring the levees up to modern building code standards and to ensure their safety. For example, in every situation possible, the Corps of Engineers replaced I-walls with T-walls, which have a horizontal concrete base that protects against soil erosion underneath the flood walls. Funding battles continue over the remaining levee improvements. In February 2008, the Bush administration requested that the state of Louisiana pay about $1.5 billion of an estimated $7.2 billion for Corps of Engineers levee work (in accordance with the principles of local cost sharing required by Congress as early as the Flood Control Act of 1928), a proposal which angered many Louisiana leaders. On May 2, 2008, Louisiana Governor Bobby Jindal used a speech to The National Press Club to request that President Bush free up money to complete work on Louisiana's levees. Bush promised to include the levee funding in his 2009 budget but rejected the idea of including the funding in a war bill, which would pass sooner. Many representatives of the news media reporting on the aftermath of Hurricane Katrina became directly involved in the unfolding events, instead of simply reporting. Because of the loss of most means of communication, such as land-based and cellular telephone systems, field reporters in many cases became conduits for information between victims and authorities. The authorities, who monitored local and network news broadcasts, as well as internet sites, would then attempt to coordinate rescue efforts based on the reports. One illustration was when Geraldo Rivera of Fox News tearfully pleaded for authorities to either send help or evacuate the thousands of evacuees stranded at the Ernest N. Morial Convention Center. The role of AM radio was also of importance to the hundreds of thousands of persons with no other ties to news, providing emergency information regarding access to assistance for hurricane victims. Immediately after Katrina, WWL-AM was one of the few area radio stations in the area remaining on the air. This emergency service, simulcasted on shortwave outlet WHRI, was named "The United Radio Broadcasters of New Orleans." Their ongoing nighttime broadcasts continued to be available up to 500 mi (800 km) away. Announcers continued to broadcast from improvised studio facilities after the storm damaged their main studios. The cellular phone antenna network was severely damaged and completely inoperable for several months. The storm also brought a dramatic rise in the role of Internet sites—especially blogging and community journalism. One example was the effort of NOLA.com, the web affiliate of New Orleans' Times-Picayune. A group of reporters were awarded the Breaking News Pulitzer Prize and shared the Public Service Pulitzer with the Biloxi-based Sun Herald. The newspaper's coverage was carried for days only on NOLA's blogs, as the newspaper lost its presses and evacuated its building as water rose around it on August 30. The site became an international focal point for news by local media, and also became a vital link for rescue operations and later for reuniting scattered residents, as it accepted and posted thousands of individual pleas for rescue on its blogs and forums. NOLA was monitored constantly by an array of rescue teams—from individuals to the Coast Guard—which used information in rescue efforts. Much of this information was relayed from trapped victims via the SMS functions of their cell phones, to friends and relatives outside the area, who then relayed the information back to NOLA.com. The aggregation of community journalism, user photos, and the use of the internet site as a collaborative response to the storm attracted international attention and was called a watershed moment in journalism. In the wake of these online-only efforts, the Pulitzer Committee for the first time opened all its categories to online entries. As the U.S. military and rescue services regained control over the city, there were restrictions on the activity of the media. On September 9, the military leader of the relief effort announced that reporters would have "zero access" to efforts to recover bodies in New Orleans. Immediately following this announcement, CNN filed a lawsuit and obtained a temporary restraining order against the ban. The next day the government backed down and reversed the ban. Because of the large death toll and destruction of property along the Gulf Coast, the name Katrina was officially retired on April 6, 2006, by the World Meteorological Organization at the request of the U.S. government. The name will never again be used for another North Atlantic hurricane. It was replaced by Katia on List III of the Atlantic hurricane naming lists, which was used in the 2011 Atlantic hurricane season. An article published in the Community Mental Health Journal from January 2016 revealed information about a recent study on the psychosocial needs of Hurricane Katrina evacuees that temporarily resided in Dallas, Texas. More than one-fourth of the sample met the criteria for major depressive disorder (MDD). About one-third of the individuals received a referral to mental health services for meeting symptom criteria for incident MDD and PTSD. In a study published in Maternal and Child Health Journal, five-to seven years after the disaster, 308 New Orleans pregnant women were interviewed about their exposure to Katrina. Researchers found that there were associations between experiencing damage during Katrina and birthweight, thus researchers concluded that natural disasters may have long-term effects on pregnancy outcomes. Furthermore, it was concluded that women who are most vulnerable to disaster may be more vulnerable to poor pregnancy outcome. From a September 2015 journal of Current Psychology, a study examined the attitudes of older, long-term residents of Baton Rouge, Louisiana toward displaced newcomers to their community. After using multiple tests, analyses, and descriptive statistics, the study suggested residents grew to become more patient, tolerant, and friendly towards newcomers. The study also suggests, however, that residents felt more fearful and suspicious of the evacuees, as well as the fact that they were being taken advantage of more. Reconstruction of each section of the southern portion of Louisiana has been addressed in the Army Corps LACPR (Louisiana Coastal Protection and Restoration) Final Technical Report, which identifies areas to not be rebuilt and areas where buildings need to be elevated. "Inundation Zones", "Water depths less than 14 feet, Raise-In-Place of Structures", "Water depths greater than 14 feet, Buyout of Structures", "Velocity Zones" and "Buyout of Structures" areas for five different scenarios. The U.S. Army Corps of Engineers submitted the report to the U.S. Congress for consideration, planning, and response in mid-2009. ^ a b c d e f g h i j k l m n o p q r s t Knabb, Richard D; Rhome, Jamie R; Brown, Daniel P; National Hurricane Center (December 20, 2005). Hurricane Katrina: August 23 – 30, 2005 (PDF) (Tropical Cyclone Report). United States National Oceanic and Atmospheric Administration's National Weather Service. Retrieved January 8, 2016. ^ "Decade After Katrina, Pointing Finger More Firmly at Army Corps". Retrieved August 13, 2018. ^ "NASA – Heat in the Gulf". www.nasa.gov. September 16, 2005. ^ Zimmermann, Kim Ann (2015). "Hurricane Katrina: Facts, Damage and Aftermath". Hurricane Katrina: Facts, Damage and Aftermath. ^ Rappaport, Edward N; National Hurricane Center (December 10, 1993). Hurricane Andrew: August 16 – 28 (Preliminary Report). United States National Oceanic and Atmospheric Administration's National Weather Service. Retrieved January 1, 2013. ^ Charles F. Anderson, Jurjen A. Battjes; et al. (2007). "The New Orleans Hurricane Protection System: What Went Wrong and Why" (PDF). American Society of Civil Engineers. Retrieved July 25, 2016. ^ Plyer, Allison (August 28, 2015). "Facts for Features: Katrina Impact". The Data Center. Retrieved February 22, 2016. ^ a b Robertson, Campbell (May 23, 2015). "Decade after Katrina pointing finger more firmly at Army Corps". New York Times. Retrieved October 31, 2015. ^ a b Nossiter, Adam (February 1, 2008). "In Court Ruling on Floods, More Pain for New Orleans". New York Times. Retrieved February 22, 2016. ^ a b c d United States Congress (February 19, 2006). A Failure of Initiative: Final Report of the Select Bipartisan Committee to Investigate the Preparation for and Response to Hurricane Katrina (PDF). Washington, DC: Government Printing Office. Archived from the original (PDF) on March 26, 2009. Retrieved May 20, 2011. ^ Leben, Robert; Born, George; Scott, Jim (September 15, 2005). "CU-Boulder Researchers Chart Katrina's Growth In Gulf Of Mexico". University of Colorado at Boulder. Archived from the original on March 1, 2009. Retrieved May 20, 2011. ^ "Monsters of the Atlantic: The Basin's Category 5 Hurricanes". The Weather Channel. Retrieved September 11, 2017. ^ Amanda Ripley (October 23, 2005). "Hurricane Katrina: How the Coast Guard Got it Right". Time Magazine. Retrieved July 6, 2014. ^ Stephen Barr (September 6, 2005). 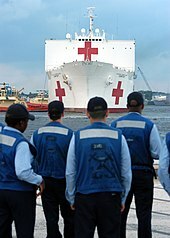 "Coast Guard's Response to Katrina a Silver Lining in the Storm". The Washington Post. Retrieved July 6, 2014. ^ George W. Bush (August 27, 2005). "Statement on Federal Emergency Assistance for Louisiana". White House Office of the Press Secretary. Retrieved July 6, 2014. ^ Congressional Reports: S. Rpt. 109-322 – Hurricane Katrina: A Nation Still Unprepared (PDF) (Report). Washington, D.C.: Federal Digital System. 2006. p. 235. Retrieved July 6, 2014. ^ "Former FEMA Director Testifies Before Congress". The New York Times. September 27, 2005. Retrieved July 6, 2014. ^ George W. Bush (August 28, 2005). "Statement on Federal Emergency Assistance for Mississippi". White House Office of the Press Secretary. Retrieved July 6, 2014. ^ George W. Bush (August 28, 2005). "Statement on Federal Emergency Assistance for Alabama". White House Office of the Press Secretary. Retrieved July 6, 2014. ^ Kathleen Blanco (August 28, 2005). Governor Blanco asks President to Declare an Emergency for the State of Louisiana due to Hurricane Katrina (PDF) (Report). Baton Rouge, Louisiana: Government of the State of Louisiana. Archived from the original (PDF) on March 4, 2012. Retrieved April 14, 2010. ^ Stacy R. Stewart (August 26, 2005). Hurricane Katrina Discussion Number 14. National Hurricane Center (Report). Miami, Florida: National Oceanic and Atmospheric Administration. Retrieved July 6, 2014. ^ Urgent – Weather Message. National Weather Service New Orleans/Baton Rouge, Louisiana (Report). New Orleans, Louisiana: National Oceanic and Atmospheric Administration. August 28, 2005. Archived from the original on March 1, 2006. Retrieved July 30, 2007. ^ "Transcripts, tape show Bush, Brown warned on Katrina". CNN. Washington, D.C. March 2, 2006. Retrieved July 6, 2014. ^ a b Staff writer. "Hurricane Katrina Situation Report No. 3." Florida State Emergency Response Team. August 26, 2005. Retrieved June 6, 2006. ^ Officials Urge Preparedness As Katrina Intensifies (Report). Federal Emergency Management Agency. August 25, 2005. Archived from the original on June 8, 2010. Retrieved April 11, 2012. ^ "Hurricane Katrina drenches Florida". Television New Zealand. Reuters. August 26, 2005. Archived from the original on December 21, 2013. Retrieved April 10, 2012. ^ Shadi Rahimi (August 25, 2005). "Tropical Storm Becomes a Hurricane as it Nears Florida". New York Times. Retrieved April 10, 2012. ^ "Reeling from hurricane, Florida braces for 2nd hit". New York Times. Agence France-Presse. August 27, 2005. Retrieved April 10, 2012. ^ Joseph B. Treaster; Shadi Rahimi (August 26, 2005). "Hurricane Moves Over Gulf After Soaking Southern Florida". New York Times. Retrieved April 10, 2012. ^ "Riley declares state of emergency due to Katrina threat". KATC, WorldNow. 2005. Archived from the original on September 28, 2007. Retrieved October 8, 2006. ^ "Service Alert: Hurricane Katrina Update – City of New Orleans, Crescent, Sunset Limited – Revised Service Information". Amtrak. September 1, 2005. Archived from the original on September 22, 2008. Retrieved May 20, 2011. ^ Louisiana Homeland Security; Emergency Preparedness. "Louisiana Citizen Awareness and Disaster Evacuation Guide". Archived from the original on July 14, 2006. Retrieved July 20, 2006. ^ "State Of Louisiana Emergency Operations Plan Supplement 1C" (PDF). July 2000. Archived from the original (PDF) on September 9, 2006. Retrieved May 20, 2011. ^ Todd Litman (April 13, 2006). "Lessons From Katrina and Rita: What Major Disasters Can Teach Transportation Planners" (PDF). Victoria Transport Policy Institute. p. 5. Archived from the original (PDF) on March 25, 2009. Retrieved May 20, 2011. ^ "Hurricane Katrina Probabilities Report Number 15," and "Hurricane Katrina Probabilities Report Number 21." National Hurricane Center. August 26, 2005. Retrieved on June 5, 2006. ^ Drye, Willie. "Hurricane Katrina Pulls Its Punches in New Orleans." National Geographic. August 29, 2005. Retrieved on June 5, 2006. ^ Staff Writer. "Katrina Heads for New Orleans." Fox News/Associated Press. August 29, 2005. Retrieved on June 5, 2006. ^ Staff Writer. "26,000 shelter at Superdome Archived November 12, 2005, at Archive-It." Times-Picayune. August 28, 2005. Retrieved on June 5, 2006. ^ Diary From the Dome is a 2008 memoir written by a tourist who was stuck inside the Superdome during Katrina and the levee failures. It offers an overview of the conditions inside the stadium as well as a critique of the media's coverage of the disaster. ^ Brown, Aaron (August 29, 2005). "Hurricane Katrina Pummels Three States". CNN. Retrieved May 20, 2011. ^ a b John L. Beven II; Lixion A Avila; Eric S. Blake; Daniel P. Brown; James L. Franklin; Richard D. Knabb; Richard J. Pasch; Jamie R. Rhome; Stacy R. Stewart (March 2008). "Annual Summary: Atlantic Hurricane Season of 2005" (PDF). Monthly Weather Review. 136 (3): 1131–1141. Bibcode:2008MWRv..136.1109B. CiteSeerX 10.1.1.212.8973. doi:10.1175/2007MWR2074.1. Retrieved July 6, 2014. ^ a b Joan Brunkard; Gonza Namulanda; Raoult Ratard (August 28, 2008). "Hurricane Katrina deaths, Louisiana, 2005" (PDF). Disaster Medicine and Public Health Preparedness. 2 (4): 215–223. doi:10.1097/DMP.0b013e31818aaf55. PMID 18756175. Archived from the original (PDF) on August 31, 2015. Retrieved August 25, 2015. ^ a b c Reports of Missing and Deceased (Report). Baton Rouge, Louisiana: Louisiana Department of Health and Hospitals. August 2, 2006. Archived from the original on February 11, 2012. ^ a b Christine F. Andersen; et al. (2007). The New Orleans Hurricane Protection System: What Went Wrong and Why (PDF) (Report). Reston, Virginia: American Society of Civil Engineers Hurricane Katrina External Review Panel. Archived from the original (PDF) on July 2, 2007. Retrieved August 27, 2008. ^ a b c d Hurricane Katrina Service Assessment Report (PDF). National Weather Service (Report). Silver Spring, Maryland: National Oceanic and Atmospheric Administration. June 2006. Archived from the original (PDF) on December 19, 2013. Retrieved July 6, 2014. ^ Poppy Markwell; Raoult Ratard. "Deaths Directly Caused by Hurricane Katrina" (PDF). Louisiana Department of Health & Hospitals. Retrieved August 25, 2015. 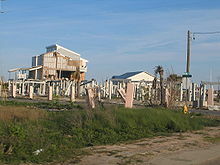 ^ "The Aftermath of Katrina". CNN. September 3, 2005. Retrieved July 6, 2014. ^ Lesley Clark (June 20, 2010). "Spill colors fabric of Gulf coastal life". The McClatchy Company. Archived from the original on July 20, 2010. Retrieved July 6, 2014. ^ Devenas, Andy "Marathon Tornado Survey Report." National Weather Service Forecast Office Key West, Florida Retrieved on June 5, 2006. ^ Associated Press, "Katrina at a Glance" (August 31, 2005), page 4A, Mobile Register, web: MobileRegister-083105-PDF Archived October 1, 2008, at the Wayback Machine. ^ RA IV Hurricane Committee Twent-Eight Session (PDF) (Report). San Juan, Puerto Rico: World Meteorological Organization. 2006. p. 58. Retrieved January 30, 2015. ^ Staff Writer. "Flooding and power outages as 'Katrina' batters western Cuba." ^ a b c Staff Writer. "Hurricane Katrina Situation Report#11 Archived November 8, 2006, at the Wayback Machine." Office of Electricity Delivery and Energy Reliability (OE) United States Department of Energy. August 30, 2005. Retrieved on June 5, 2006. ^ "FEMA: Louisiana Katrina Surge Inundation Map, January 2006" (PDF). Retrieved November 3, 2011. ^ Cannizaro, Steve. "List of Missing Residents Down to 47, and More..." St. Bernard Parish Government (press release). December 17, 2005. Retrieved on June 5, 2006. ^ "Current Housing Unit Damage Estimates, Hurricanes Katrina, Rita, and Wilma" (PDF). U.S. Department of Housing and Urban Development. February 12, 2006. Retrieved June 7, 2015. ^ Rosenzweig, C., G. Casassa, D.J. Karoly, A. Imeson, C. Liu, A. Menzel, S. Rawlins, T.L. Root, B. Seguin, P. Tryjanowski. (2007). "Assessment of observed changes and responses in natural and managed systems. Climate Change 2007: Impacts, Adaptation and Vulnerability". Chapter 1 in Contribution of Working Group II to the Fourth Assessment Report of the Intergovernmental Panel on Climate Change, (M.L. Parry, O.F. Canziani, J.P. Palutikof, P.J. van der Linden and C.E. Hanson, Eds. ), Cambridge University Press, Cambridge, UK. (url : http://www.ipcc.ch/pdf/assessment-report/ar4/wg2/ar4-wg2-chapter1.pdf). Pp 92. Accessed December 19, 2011. ^ Murphy, Verity. "Fixing New Orleans' thin grey line." BBC News. October 4, 2005. Retrieved on June 5, 2006. ^ Gordon, Meghan. "Causeway closed but hardly damaged." Times Picayune. August 31, 2005. Retrieved on June 5, 2006. ^ Transcript from, The NewsHour with Jim Lehrer. "Hurricane Damages Gulf Coast." PBS. August 29, 2005. Retrieved on June 5, 2006. ^ Mowbray, Rebecca. "Evacuations to hotels come with own set of hazards Archived July 1, 2009, at the Portuguese Web Archive." Times-Picayune. August 30, 2005. Retrieved on June 5, 2006. ^ Gibson, Christine (August 1, 2006). "Our 10 Greatest Natural Disasters". American Heritage. Retrieved February 22, 2016. ^ "Hurricane Katrina from the Airport's Point of View". Web Archive of Fly MSY website. September 21, 2005. Archived from the original on March 12, 2006. Retrieved February 22, 2016. ^ Warner, Coleman; Travis, Robert. "Where They Died." Times-Picayune. October 23, 2005. Retrieved on June 5, 2006. ^ O'Neill, Ann. "Identifying victims a grueling task." CNN. September 9, 2005. Retrieved on June 5, 2006. ^ Davis, Robert; Johnson, Kevin (October 17, 2005). "La. looks into 215 Katrina deaths – Inquiry includes euthanasia report". USA Today. Arlington, VA.
^ Canfield, Sabrina (March 24, 2011). "Hospital Settles Katrina Deaths Class Action". Courthouse News Service. Archived from the original on September 23, 2015. Retrieved March 4, 2014. ^ "Patients finally rescued from Charity Hospital". cnn.com. Cable News Network. Retrieved August 19, 2016. ^ a b Thevenot, Brian; Russell, Gordon. "Reports of anarchy at Superdome overstated Archived October 23, 2005, at the Wayback Machine." Seattle Times. September 26, 2005. Retrieved on June 5, 2006. ^ Left to Die in a New Orleans Prison, Democracy Now/AlterNet, September 27, 2005. Retrieved November 28, 2012. ^ The Fate of Prisoners during Hurricane Katrina, The Society Pages, August 27, 2011. Retrieved November 28, 2012. ^ New Orleans prisoners left to drown after Katrina struck, World Socialist Web Site, October 1, 2005. Retrieved November 28, 2012. ^ Abandoned & Abused: Report on the effects of Hurricane Katrina on New Orleans Prisons (PDF) (), American Civil Liberties Union, August 9, 2006. Retrieved November 28, 2012. ^ a b Haley Babour (January 6, 2006). "Information Relating to the Federal Appropriations for Katrina Recovery". Office of the Governor, Mississippi. Archived from the original on September 28, 2007. Retrieved September 27, 2006. ^ a b Staff Writer. "Mississippi Coast Areas Wiped Out." CBS News. September 1, 2005. Retrieved on June 5, 2006. 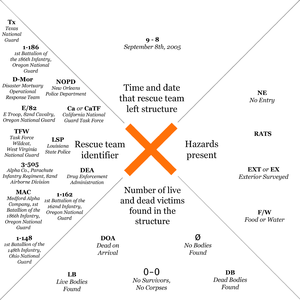 ^ Federal Emergency Management Agency (November 2005). "Mississippi Hurricane Katrina Surge Inundation and Advisory Base Flood Elevation Map Panel Overview" (PDF). FEMA. Retrieved July 16, 2006. ^ Westbrook, Robby; WFO Peachtree City Staff. "Katrina Spawns Tornadoes in Georgia – August 29, 2005." National Oceanic and Atmospheric Administration. December 1, 2005. Retrieved on April 14, 2010. ^ "Hurricane Katrina Rainfall Summary". Hydrometeorological Prediction Center. 2005. Retrieved November 4, 2006. ^ Staff Writer. "Hopkinsville Swamped By Floodwaters; 10-Year-Old Drowns." WAVE (TV). September 6, 2005. Retrieved on June 5, 2006. ^ Staff Writer. "Gov. Fletcher Declares Three Kentucky Counties Disaster Areas." WKYT. Accessed on April 18, 2006. Retrieved on April 14, 2010. ^ Blanton, Carla; Goins, Michael; Whitaker, Jodi. "Governor Fletcher declares state of emergency in Kentucky." Commonwealth of Kentucky (Press Release). August 30, 2005. Retrieved on April 14, 2010. ^ Canadian Tropical Cyclone Season Summary for 2005 (Report). Gatineau, Quebec: Environment Canada. January 15, 2014. Retrieved January 31, 2015. ^ "Rain from Katrina washes out Quebec north shore roads". CBC News. September 1, 2005. Retrieved January 31, 2015. ^ "Assessing the U.S. Climate in 2018". National Centers for Environmental Information (NCEI). 2019-02-06. Retrieved 2019-02-09. ^ St. Onge, Jeff; Epstein, Victor. "Ex-chief says FEMA readiness even worse." Boston.com. April 1, 2006. Retrieved on June 5, 2006. ^ Fagot, Caryl; Winbush, Debra. "Hurricane Katrina/Hurricane Rita Evacuation and Production Shut-in Statistics Report as of Wednesday, February 22, 2006 Archived May 10, 2006, at the Wayback Machine." U.S. Government Minerals Management Service Archived November 26, 2005, at the Wayback Machine. February 22, 2006. Retrieved on June 5, 2006. ^ a b c d e Sheikh, Pervaze A. (October 18, 2005). "The Impact of Hurricane Katrina on Biological Resources" (PDF). Congressional Research Service. Archived from the original (PDF) on June 24, 2008. Retrieved April 14, 2010. ^ Burton, Mark L.; Hicks, Michael J. "Hurricane Katrina: Preliminary Estimates of Commercial and Public Sector Damages Archived October 17, 2005, at the Wayback Machine." Marshall University: Center for Business and Economic Research. September 2005. Retrieved on June 5, 2006. ^ Insurance Institute. "Archived copy" (PDF). Archived from the original (PDF) on May 21, 2014. Retrieved May 20, 2014. CS1 maint: Archived copy as title (link) Retrieved on May 17, 2014. ^ Anthony E. Ladd, John Marszalek, and Duane A. Gill. The Other Diaspora: New Orleans Student Evacuation Impacts and Responses Surrounding Hurricane Katrina. Retrieved on April 14, 2010. ^ Mema Ayi (August 30, 2006). "Katrina evacuees at home in Chicago". Chicago Defender. Archived from the original on December 12, 2007. Retrieved April 14, 2010. ^ Greg Stone; Tim Grant; Nathaniel Weaver (2006). "Rapid Population Estimate Project: January 28 – 29, 2006 Survey Report" (PDF). Emergency Operations Center, City of New Orleans. Archived from the original (PDF) on July 7, 2010. Retrieved April 14, 2010. ^ Christie, Les. "Growth states: Arizona overtakes Nevada: Texas adds most people overall; Louisiana population declines nearly 5%." CNN. December 22, 2006. Retrieved on December 22, 2006. ^ Staff Writer. "More Bad News Blows In From Katrina." CBS News. May 28, 2006. Retrieved on June 5, 2006. ^ a b c Miguel Llanos (September 19, 2005). "44 oil spills found in southeast Louisiana". MSNBC. MSNBC. Retrieved June 15, 2006. ^ United States Geological Survey (September 14, 2005). "Daupin Island — Pre- and Post-Storm 3D Topography". Hurricane Katrina Impact Studies. USGS. Retrieved June 5, 2006. ^ United States Geological Survey (September 14, 2005). "Before and After Photo Comparisons: Chandeleur Islands". Hurricane Katrina Impact Studies. USGS. Retrieved June 5, 2006. ^ Mike Tidwell (2006). The Ravaging Tide: Strange Weather, Future Katrinas, and the Coming Death of America's Coastal Cities. Free Press. p. 22. ISBN 978-0-7432-9470-6. Retrieved April 14, 2010. ^ a b United States Fish and Wildlife Service (September 9, 2005). "U.S. Fish and Wildlife Service Conducting Initial Damage Assessments to Wildlife and National Wildlife Refuges". USFWS. Retrieved June 5, 2006. ^ Chapman, Elise (2008). "Hurricane Katrina Impacts on Forest Trees of Louisiana's Pearl River Basin". Forest Ecology and Management. 256 (5): 883–889. doi:10.1016/j.foreco.2008.05.057. ^ Henkel, Theryn (2016). "Delayed Tree Mortality and Chinese Tallow Explosion in Louisiana Bottomland Hardwood Forest Following Hurricane Katrina". Forest Ecology and Management. 378: 222–232. doi:10.1016/j.foreco.2016.07.036. ^ Chambers, Jeffrey Q.; Fisher, Jeremy I.; Zeng, Hongcheng; Chapman, Elise L.; Baker, David B.; Hurtt, George C. (January 1, 2007). "Hurricane Katrina's Carbon Footprint on U.S. Gulf Coast Forests". Science. 318 (5853): 1107. Bibcode:2007Sci...318.1107C. doi:10.1126/science.1148913. JSTOR 20051600. PMID 18006740. ^ "Hurricane Katrina : Aug 31: Looting in Mississippi". KLRT. Little Rock, Arkansas. August 31, 2005. ^ Sarah Rosenblatt; James Rainey (September 27, 2005). "Rita's Aftermath; Katrina Takes a Toll on Truth, News Accuracy". Los Angeles Times. p. A16. Retrieved July 6, 2014. ^ "New Orleans rocked by huge blasts". BBC. September 2, 2005. Retrieved March 4, 2016. ^ Jake Tapper (September 13, 2005). "Amid Katrina Chaos, Congressman Used National Guard to Visit Home". ABC News. Retrieved July 6, 2014. ^ "Police kill at least 5 in New Orleans". MSNBC. September 4, 2005. Retrieved July 6, 2014. ^ "Ex-cop gets 8 years for role in post-Katrina shootings". CNN. December 2, 2010. ^ "At the Train Station, New Orleans' Newest Jail is Open For Business". KOMO-TV. New Orleans, Louisiana. September 6, 2005. Archived from the original on November 19, 2014. Retrieved July 6, 2014. ^ Elizabeth Schubert (September 18, 2005). "Some Katrina Evacuees at Camp Dawson Have Criminal Records". WBOY-TV. Associated Press. Archived from the original on September 28, 2011. Retrieved June 5, 2006. ^ Verano, Paul (January 1, 2010). "A Tale of Three Cities: Crime and Displacement after Hurricane Katrina". Journal of Criminal Justice. 38: 42–50. doi:10.1016/j.jcrimjus.2009.11.006. ^ Settles, Tanya; Lindsay, Bruce (August 23, 2010). "Crime in post-Katrina Houston: the effects of moral panic on emergency planning". Disasters. 35 (1): 200–219. doi:10.1111/j.1467-7717.2010.01200.x. PMID 20735458. ^ "New Orleans gang wars spill into Houston area". Retrieved September 18, 2015. ^ a b "The Federal Response to Hurricane Katrina: Lessons Learned". The White House. January 20, 2009. Retrieved June 7, 2015. ^ United States Government Accountability Office (July 2006). Coast Guard: Observations on the Preparation, Response, and Recovery Missions Related to Hurricane Katrina (PDF). Retrieved August 27, 2006. ^ United States Congress (September 21, 2005). Senate Resolution 246: To express the sense of the Senate regarding the missions and performance of the United States Coast Guard in responding to Hurricane Katrina (PDF). Government Printing Office. Retrieved August 27, 2006. ^ "USCG Message Traffic: Award of the Presidential Unit Citation to the Coast Guard". United States Coast Guard. May 25, 2006. Retrieved November 15, 2008. ^ "Special Defense Department Briefing with Commander of Joint Task Force Katrina". United States Department of Defense, News Transcript. September 1, 2005. Retrieved on April 14, 2010. ^ Phillips, Kyra. "Bush Discusses Displaced Students; Department of Defense Briefs Press on Katrina Response (CNN Live Transcript)." CNN. September 6, 2005. Retrieved on June 5, 2006. ^ California Political Desk. "Pelosi: Davis Report on Katrina Leaves Unfinished Business Archived October 27, 2006, at the Wayback Machine." California Chronicle Archived June 17, 2006, at the Wayback Machine. February 15, 2006. Retrieved on June 5, 2006. ^ Baker, Peter; Goldstein, Amy. "Congress Approves $51.8 Billion For Victims." Washington Post. September 9, 2005. Retrieved on June 5, 2006. ^ Bush, George W. "President Asks Bush and Clinton to Assist in Hurricane Relief." White House, Press Release. September 1, 2005. Retrieved on June 5, 2006. ^ "Proclamation by the President: Honoring the Memory of the Victims of Hurricane Katrina". Whitehouse.gov. Retrieved October 27, 2008. ^ Times-Picayune, September 26, 2005, page A-12. Retrieved on June 5, 2006. ^ Foster, Mary. "Judge: FEMA Off Hook For Hotel Costs." CBC News. February 13, 2006. Retrieved on June 5, 2006. ^ Al Showers (March 30, 2010). "Hancock Co. woman struggles to get out of FEMA trailer". WLOX Channel 13. Retrieved April 14, 2010. ^ Treaster, Joseph B. (September 4, 2005). "Law Officers, Overwhelmed, Are Quitting the Force". New York Times. Retrieved June 24, 2006. ^ Quigley, Bill (February 21, 2006). "Six Months After Katrina: Who Was Left Behind Then and Who is Being Left Behind Now?". Archived from the original on March 9, 2009. Retrieved November 15, 2008. ^ Clark, Heather. "Linguists Vote 'Truthiness' Word of 2005." ABC News. January 6, 2006. Retrieved on April 14, 2010. ^ de Moraes, Lisa (September 3, 2005). "Kanye West's Torrent of Criticism, Live on NBC". The Washington Post. Retrieved September 1, 2008. ^ David Kirkpatrick; Scott Shane (September 15, 2005). "Ex-FEMA Chief Tells of Frustration and Chaos". The New York Times. Retrieved May 13, 2010. ^ Meserve, Jeanne; Barrett, Ted. "Admiral takes over Katrina relief." CNN. September 9, 2005. Retrieved on June 5, 2006. ^ Office of the Press Secretary (September 2, 2005). "President Arrives in Alabama, Briefed on Hurricane Katrina". The White House. Retrieved July 19, 2006. ^ Langer, Gary. "Poll: Bush Not Taking Brunt of Katrina Criticism." ABC News. September 12, 2005. Retrieved on July 15, 2006. ^ Staff Writer. "Poll: Most Americans believe New Orleans will never recover." CNN. September 8, 2005. Retrieved on July 15, 2006. ^ "Venezuela and Cuba offer US aid ." Al Jazeera, September 7, 2005. Retrieved on April 14, 2010. ^ "Venezuela and Cuba offer aid to Katrina victims." The Free Press, Volume 1, Issue 4. Retrieved on April 14, 2010. ^ "From abroad, offers of aid for Katrina victims." People's Weekly World, September 10, 2005. Retrieved on April 14, 2010. ^ "France, Cuba, Venezuela among those offering aid." USA Today, September 2, 2005. Retrieved on August 5, 2007. ^ Staff Writer. "U.S. Grateful for Pakistan's Assistance for Hurricane Katrina Victims. "Embassy of the United States. September 8, 2005. Retrieved on April 14, 2010. ^ "Katastroferammede i USA får hjelp fra Norge på 10 millioner kroner". October 24, 2006. ^ Staff Writer. "Asian nations offer U.S. assistance." BBC News. September 5, 2005. Retrieved on June 5, 2006. ^ Ministry of Foreign Affairs. "Israel Aids Hurricane Katrina Victims." MFA. September 5, 2005. Retrieved on December 17, 2006. ^ Jewish Virtual Library. "Israel's Aid to Hurricane Katrina Victims." Jewish Virtual Library. ^ Staff Writer. "U.S. rejects British Katrina beef." BBC News. October 15, 2005. ^ Staff Writer. "U.S. receives aid offers from around the world." CNN. September 4, 2005. Retrieved on June 5, 2006. ^ Jones, Steven T. (February 22, 2006). "From here to Katrina". San Francisco Bay Guardian. Retrieved May 18, 2006. ^ "Church Providing Relief to Hurricane Katrina Victims". The Church of Jesus Christ of Latter-day Saints. September 1, 2005. Retrieved January 15, 2010. ^ "Latter-day Saints to Mobilize Another 4,000 Volunteers in Chainsaw Brigade's Second Wave". The Church of Jesus Christ of Latter-day Saints. September 16, 2005. Retrieved January 18, 2010. ^ Jared Johnson (October 20, 2005). "Mormon Helping Hands Make a Difference". Meridian Magazine. Retrieved June 7, 2015. ^ Staff writer (2006). "Where Did The Money Go?". Hurricane Katrina: One Year Later. Charity Navigator. Retrieved August 5, 2006. ^ "Al Gore Airlifts Evacuees — Politics | Republican Party | Democratic Party | Political Spectrum — FOXNews.com". FOXnews.com. September 9, 2005. Archived from the original on April 20, 2007. Retrieved February 19, 2012. ^ Staff Writer (September 16, 2005). "ARRL President Submits Congressional Testimony on Hams' Katrina Response". 24 (36). American Radio Relay League. Retrieved April 14, 2010. ^ Rick Palm. "ARES E-Letter for September 22, 2005." The American Radio Relay League. September 22, 2005. Retrieved on April 14, 2010. ^ "Corporate Katrina gifts could top $1B." CNN. September 13, 2005. Retrieved on June 5, 2006. ^ "A Year of Healing" (PDF). American Red Cross. September 29, 2006. Archived from the original (PDF) on January 21, 2012. 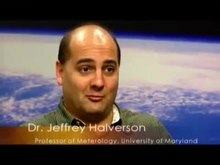 ^ "Hurricane Season 2005: Facts and Figures". American Red Cross. September 29, 2006. Archived from the original on May 1, 2006. ^ "Hurricane Katrina Relief". Direct Relief. 2018-04-25. Retrieved 2019-03-22. ^ "Salvation Army Reflects on Largest Disaster Response Ever at One-Year Anniversary of Hurricane Katrina". The Salvation Army. August 28, 2006. Retrieved April 14, 2010. ^ Staff Writers "Problems with the design of levees." Unregistered News. September 29, 2005. Retrieved on April 14, 2010. ^ J. David Rogers; G. Paul Kemp (2015). "Interaction between the US Army Corps of Engineers and the Orleans Levee Board preceding the drainage canal wall failures and catastrophic flooding of New Orleans in 2005". Water Policy. p. 707. Retrieved January 28, 2017. ^ Stoltz, Mary Helen (August 24, 2015). "Flood damage after Katrina could have been prevented, S&T expert says". Missouri S&T. Retrieved February 22, 2016. ^ Heerden, Ivor van; Bryan, Mike (May 18, 2006). The Storm: What Went Wrong and Why During Hurricane Katrina—the Inside Story from One Louisiana Scientist. Penguin. ISBN 9781101201701 – via Google Books. ^ Warrick, Joby; Grunwald, Michael. "Investigators Link Levee Failures to Design Flaws." Washington Post. October 24, 2005. Retrieved on June 5, 2006. ^ Crenson, Matt (February 2, 2006). "Levee Repairs to Be Finished By First Day of Hurricane Season". Associated Press. Retrieved May 12, 2008. ^ Burdeau, Cain (February 12, 2008). "White House Budget for Levee Work Riles Many Louisiana Elected Officials". Associated Press. Retrieved May 12, 2008. ^ Shields, Gerard (May 3, 2008). "Jindal asks Bush for levee cash". 2theadvocate.com. Retrieved May 12, 2008. ^ "Geraldo Rivera & Shepard Smith Unleashed". Spike.com. September 5, 2005. Archived from the original on March 14, 2016. Retrieved January 4, 2016. ^ The Pulitzer Board (2006). "2006 Pulitzer Prize Winners — Breaking News Reporting". Retrieved November 15, 2008. ^ The Pulitzer Board (2006). "2006 Pulitzer Prize Winners — Public Service". Retrieved November 15, 2008. ^ Mark Glaser (September 13, 2005). "NOLA.com blogs and forums help save lives after Katrina". Online Journalism Review. Archived from the original on July 20, 2006. Retrieved August 2, 2006. ^ Paul Steiger (May 22, 2006). "Remarks at Pulitzer Prize luncheon". The Pulitzer Board. Retrieved November 15, 2008. ^ Staff Writer. "U.S. won't ban media from New Orleans searches." CNN. September 11, 2005. Retrieved on June 5, 2006. ^ "Dennis, Katrina, Rita, Stan, and Wilma "Retired" from List of Storm Names". NOAA. April 6, 2006. Retrieved August 28, 2006. ^ King, Richard V.; Polatin, Peter B.; Hogan, David; Downs, Dana L.; North, Carol S. (January 1, 2016). "Needs Assessment of Hurricane Katrina Evacuees Residing Temporarily in Dallas". Community Mental Health Journal. 52 (1): 18–24. doi:10.1007/s10597-015-9938-5. ISSN 1573-2789. PMID 26507550. ^ Harville, Emily W.; Giarratano, Gloria; Savage, Jane; Barcelona de Mendoza, Veronica; Zotkiewicz, TrezMarie (November 1, 2015). "Birth Outcomes in a Disaster Recovery Environment: New Orleans Women After Katrina". Maternal and Child Health Journal. 19 (11): 2512–2522. doi:10.1007/s10995-015-1772-4. ISSN 1573-6628. PMC 4596760. PMID 26122255. ^ Kamo, Yoshinori; Henderson, Tammy L.; Roberto, Karen A.; Peabody, Kimberly L.; White, Jamikka K. (August 2, 2015). "Perceptions of Older Adults in a Community Accepting Displaced Survivors of Hurricane Katrina". Current Psychology. 34 (3): 551–563. doi:10.1007/s12144-015-9356-4. ISSN 1046-1310. ^ United States Army Corps of Engineers (2009). "The LACPR Home Page". United States Army. Archived from the original on August 25, 2009. Retrieved August 9, 2009. Augustson, Alan (August 31, 2008). Bernstein, Jonathan, ed. "Katrina: Three Years Later, The Lessons We Haven't Learned". Crisis Manager. Bernstein Crisis Management. ISSN 1528-3836. Retrieved June 3, 2017. Brennan, Virginia (2009). Natural Disasters and Public Health: Hurricanes Katrina, Rita, and Wilma. Baltimore: Johns Hopkins University Press. ISBN 978-0-8018-9199-1. Center for Public Integrity, ed. (2007). City Adrift: New Orleans Before and After Katrina. Baton Rouge: LSU Press. ISBN 978-0-8071-3284-5. Dyson, Michael Eric (2006). Come Hell or High Water: Hurricane Katrina and the Color of Disaster. New York: Perseus Books Group. ISBN 978-0-465-01761-4. Eggers, Dave (2009). Zeitoun. San Francisco: McSweeney's Books. ISBN 978-1-934781-63-0. Eyerman, Ron (2015). Is This America? Katrina as Cultural Trauma. The Katrina Bookshelf. Austin: University of Texas Press. ISBN 9781477303689. OCLC 900609113. Harris, Paul (2008). Diary From the Dome. New York: Vantage Press. ASIN B003M69KSC. Hartman, Chester; Squires, Gregory D., eds. (2006). There Is No Such Thing as a Natural Disaster: Race, Class, and Hurricane Katrina. Routledge. ISBN 978-0-415-95487-7. Saint-Saens, Alain (2010). Ordeal at the Superdome. Escaping Katrina's Wrath. New Orleans: University Press of the South. ISBN 978-1-889431-87-1. Scott, Cathy (2008). Pawprints of Katrina: Pets Saved and Lessons Learned. Hoboken: Howell Book House. ISBN 978-0-470-22851-7. Spielman, David G. (2007). Katrinaville Chronicles: Images and Observations from a New Orleans Photographer. Baton Rouge: LSU Press. ISBN 978-0-8071-3252-4. Taylor, William M., ed. (2015). The "Katrina Effect": On the Nature of Catastrophe. London; New York: Bloomsbury Academic. ISBN 9781472595164. OCLC 893894307.